4 Beds 3 Baths 2,503 Sq. ft. LOCATION IS EVERYTHING! Spruce Creek High, Creekside Middle & Sweetwater Elementary! 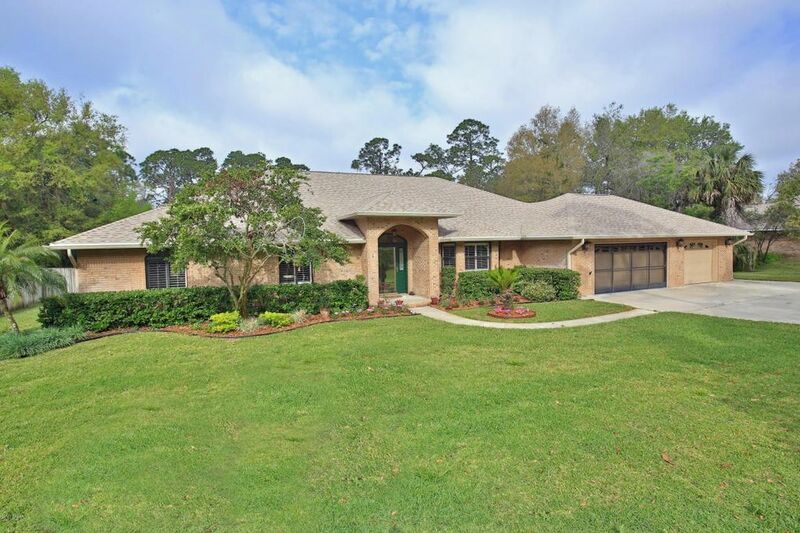 Situated on beautifully landscaped 1 acre lot that screams privacy & country but actually is right in central Port Orange! Car lovers & people with BIG toys take notice. There is an attached 925 sq ft garage & a detached 640 sq ft garage with separate a/c system & 6000 lb car lift! All this and now lets talk about this amazing BRICK home! 2017 Architectural Roof! ''Two'' new 2016 A/C systems! 2016 Hotwater tank! Hardwood floors! Plantation shutters! Great room with cathedral ceiling & a wood stove! Oak cabinetry with beautiful granite counters! Double wall ovens! 2016 new fridge, microwave & dishwasher! Breakfast bar open to nook! Private dining room with pocket doors! King size master suite, Master bath with separate shower & garden tub & double closets! 3 additional generous sized bedrooms & 1 bath on split side of house! 3rd bath set up perfect for future pool! Kids play house! Paverstone patios! Large garden islands! This truly is a must see home!